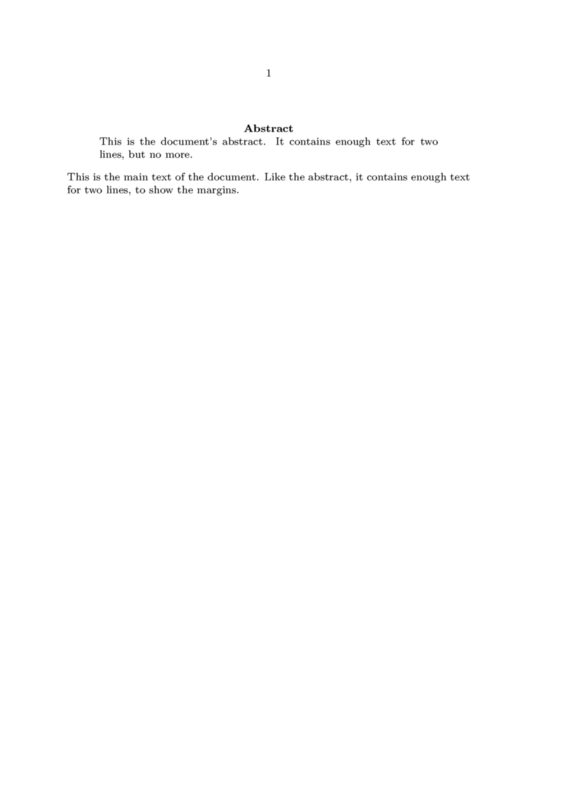 Much as with Document Titles, the standard LaTeX article and report classes define an abstract environment to typeset an abstract in a way that distinguishes it from the rest of the text. In a single-column article, it is set somewhat narrower than the main text, with the word "Abstract" centered above it. The simplest way of producing an abstract in a ConTeXt document is to specify the formatting directly. The code from LaTeX's classes.dtx is nearly trivial, and is quite easy to replicate in ConTeXt idioms. This is the document's abstract. It contains enough text for two lines, but no more. for two lines, to show the margins. This code can be placed in the document header, or can be placed in a module file to be loaded in a number of documents. It could also be enhanced by \if statements to distinguish between the one-column and two-column cases, as LaTeX does. In any case, once these commands are defined, they can be used in the obvious manner. This, of course, produces exactly the same result as the previous illustration. This page was last edited on 12 February 2006, at 18:35.